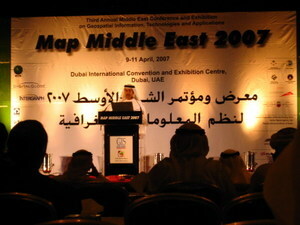 I just spent a couple of days at Map Middle East 2007 in Dubai. The theme of this year's conference was Geospatial Convergence: The Next step. Dubai is a perfect place for this theme. I find Dubai to be one of the wonders of the modern world because the geography of Dubai is being completely transformed , or even created, by architecture and engineering design. Everyone has seen pictures of the Burj Al Arab Hotel, and the two Palm and World marinas. Another major new development is Burj Dubai, currently at 120 floors and surpassing the Sears Tower. The current prognostication is that it will reach 176+ floors, just short of a kilometer in height, but no one really seems to know how high it will be when it is completed. One statistic that is published is that the elevators will travel at 40 miles/hr. 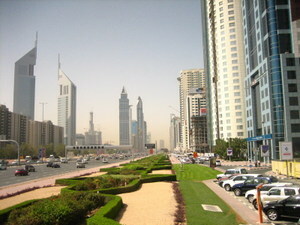 You can see the Burj Dubai in the far back left in the photo I have attached. Mass market geospatial technology, meaning Google Maps/Earth, Yahoo Maps, Microsoft Virtual Earth, and MapQuest. The convergence of architectural and engineering design and geospatial. That many more people are using geospatial technology than have ever heard of geospatial or know what the letters GIS stand for. The impact of mass market means that massive numbers of consumers are using geospatial technology. For example, as of several months ago Google reported 200 million downloads of Google Earth. If I remember, MapQwest handles upward of 40 million user sessions per month. The impact of the convergence AEC (architectural, engineering, and construction) and geospatial, is more subtle, but the importance is exemplified by Dubai itself, where many of the developments are so massive, such as the Palm and World marinas, that engineers and architects can't ignore the geospatial context for what is being designed. This means that increasingly architectural and engineering designs will be georeferenced. So whether you are using CAD or next generation building information modeling (BIM) you will be locating the building at a real geographic location. As evidence of the importance of geospatial context, the next version of the IAI's Industry Foundation Classes standard, IFC 2x3g, includes georeferencing. This will have wide ramifications because the Industry Foundation Classes (IFC) standard is emerging as an open international standard for building information exchange. The General Services Administration (GSA) in the USA has chosen IFC as their building information model (BIM) standard. Apparently Norway and China will also base building information models for their building projects on the IFC standard. IFC 2x3g is one of the first outcomes of the memorandum of understanding (MoU) signed between the Open Geospatial Consortium (OGC) and the International Alliance for Interoperability (IAI). The Initial objective of this agreement was to improve the sharing of XML based Industry Foundation Class XML (ifcXML-IFC) building models and Geography Markup Language (GML) geospatial models.